27, of North Berwick, Maine; assigned to the 744th Transportation Company, Army National Guard, Hillsboro, N.H.; died March 29 when his vehicle hit an improvised explosive device and fell from a bridge near Balad, Iraq. To honor SGT Jeremiah J. Holmes, his sister, Nancy Allard Jusseaume retrieved this stone from their parents herb garden in North Berwick, Maine. thinking of you and sending loving thoughts to your family. Jay is Never Forgotten! My name is Joy Owens and I had the honor of learning about Army National Guard Spc. Jeremiah J. Holmes for The Summit Project. Due to unforeseen circumstances I was assigned a new stone at the start of the hike that represented all of Maine’s fallen heroes from July 4, 1976 to September 11, 2001. I felt honored to be carrying the “life” of so many heroes up Cadillac Mountain. I could feel the spirit, the burdens, and emotions of those heroes during the hike. Although I was unable to carry Jay’s stone (as I learned he was affectionately called by family and friends), I did very much think of him and his family during the hike since I already felt emotionally connected. The weather was less than perfect for the hike and all I could think of is that rain, that mist, that wind, those were tears shed by the families, the friends, fellow heroes. I didn’t care that the weather didn’t cooperate, that we couldn’t see more than 25 feet for visibility, that it was cold, all I cared about was those soldiers, Jay, along with their families and what obstacles they have had to overcome with the loss of such amazing lives. The elevation of the mountain, poor visibility, rain, and wind was NOTHING compared to what they had to go through. I embraced the challenge, each step I took, we worked together as a team, we slowed down as needed, stopped for break as needed and we conquered that mountain as a whole. As the summit of Cadillac Mountain, although I wasn’t able to hike with Jay’s stone, I did share what I had learned about him anyway. I thought of his wife and child, his family, even his mother whom he had lost at a young age. A life full of obstacles and he gave his own life fighting for our country. I shared about his family, his love for swimming, his horseshoe playing, his hearty laugh, and his personality, I wish I had been able to meet him in person, he seems like he was a wonderful man. At the summit is when I realized that Jay’s stone was actually with another man on my own team. I had a feeling the entire time and I think I know why, I could FEEL the presence. The other gentleman was kind enough to offer for me to carry Jay’s stone for the remainder of the trip to which I happily agreed would be a magnificent idea! The Summit Project was an amazing experience and I am really looking forward to taking on the challenge again. Hello, my name is Rick Barnaby a member of Patriot Riders of America Maine chapter 1. This is the second time I have had the Privilege and Honor of carrying a Summit Project Stone during our annual Spring Ride for the Troops. This time I carried Spc. Jeremiah J. Holmes. I learned he lived in the town adjacent to mine while reading his bio… To say Thank You to his family just doesn’t seem to be enough, to touch and carry a stone that they handpicked to represent their family member is such an emotional time, I can’t imagine how it must have been for them and will Forever be a tie and remembrance that All will Cherish and Respect Forever. God Bless and Forever Grateful for you Service and Sacrifice to our Great nation, You nor your family will Ever be forgotten. Hello, my name is Jett Troutt. I’m 16 years of age, a sophomore at Hermon High school and a member of the JROTC program for the past two years. At the age of seven, my life changed dramatically when my cousin, SPC Dustin J. Harris was killed in Iraq. Over the last nine years our family has grown with love and support from our fallen heroes families. This was the main reason I decided to participate in the hike for the Summit Project, by sharing your Hero’s legacy. The heroism and sacrifice our soldiers have given for our country is dear to my heart. I was given the honor of carrying SPC Jeremiah “Jay” Holmes stone. The connection I felt with Spc. Holmes was the day he had lost his life is also my birthday. I feel Spc. Holmes family needs to know how a person I have never met had touched my life. It was my honor to carry your Hero’s stone. I carried a picture of him and his son along with the stone in my backpack. I was a part of the third group which was the blue team. As we hiked up the mountain and neared the top, although most of us didn’t know each other we all had the sense of heavy hearts. Once we reached the peak we gathered around in a circle and began one of the most touching parts of the hike. It was nice hearing everyone’s connections with their soldier’s stones and highlights of all the soldiers’ lives. The entire weekend was an amazing experience, and it was an honor to feel a part of Spc Holmes legacy. The stories shared, tears and gratitude we each felt transformed us from strangers to a bond we each experienced that most would not understand. It was my honor and what little bit I could contribute to your Hero’s Legacy by carrying his stone and sharing a part of his life. God Bless America! 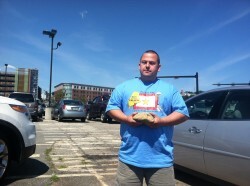 My name is Jordan Mackin and I had honor of carrying the memorial stone of Army National Guard Spc. Jeremiah J. Holmes on October 17th, 2015, during The Summit Project hike at Acadia National Park. Prior to the hike, I made it my mission to learn as much about SGT Holmes’ life as possible. SGT Holmes was a strong, resilient family man, who took great pride in protecting his country. His friends and family most often called him Jay, but in the weeks leading up to the hike, I always referred to him as Jeremiah. Last weekend, as we neared the summit of Cadillac Mountain, I had the honor of carrying our country’s flag along with the memorial stone of a man who made the ultimate sacrifice for our country and our freedoms; all while being surrounded by an amazing group of people who shared my same passion for making sure our Maine heroes are not forgotten. It’s hard to put into words the feelings of pride, serenity, and complete happiness that consumed me in that moment. I was overcome by thoughts and emotions as we embarked upon the summit. As we all gathered around for our summit ceremony, I could no longer recall the words I had planned to share about SGT Holmes. When it came to my turn to speak, my mind was blank but somehow the words flowed out of my mouth just as smoothly as the tears rolling down my cheeks. While sharing SGT Holmes’ story, I began referring to him as Jay; just as if I had known him in the same way his family and friends did. Although I never got the chance to meet Jay, I feel a connection with him that I can’t even begin to put into words. He will forever hold a special place in my heart and I am extremely honored that I got to experience my first Summit Project hike with him. I will forever keep Jay’s memory alive and make it my mission to share his story with anyone that will listen. I was extremely honored to carry Jays stone during a Veterns Day Remembrance 4 mile run followed by a hike up Blue Hill Mountain. I remember hiking up the mountain caring his stone with my two daughters at my side. We talked about the importance of the stone, The Summit Project and I told them Jays story. They were full of questions and I was happy to answer them and explain how he fought for our country and should never be forgotten. The day after the hike my girls went to school and shared all the information I had told them with their classmates. Talking to them about the stone and the importance of it and how Jeremiah served our country. That’s what this is all about, remembering our heroes. Making sure they are never forgotten. Through TSP and my experience with it I connected to a soldier in a way I never thought I would. And seeing others, like my daughters, find that connection as well and hearing how they passed it along to others is how we make sure that Maine Soldoers like Jay will never be forgotten. I had the pleasure of hiking with Jay’s stone on my family’s annual Christmas Day hike. This year it was a clear and unusually warm December day. The light danced in the trees and I could feel his fun-loving, kind and lively presence in the sparkling icy stream, prancing shadows and playful light beams. As a mother, wife, sister and daughter I keenly felt his loss. And at the summit I became aware that my best Christmas gift was the honor of placing his namesake high into the golden sky. To the family of Army National Guard SGT Jeremiah J. Holmes: I had the honor and privilege to carry the stone of Army National Guard SGT Jeremiah J. Holmes as part of The Summit Project hike at Baxter State Park on Sunday, May 29, 2016. There were some challenging conditions on the hike due to the rain, wind and cold weather. The challenging parts of the hike reminded me of how much Jay overcame personally as a young man. It takes a truly strong person to overcome the personal losses Jay experienced at such a young age. The challenging parts of the hike reminded me of Jay’s selflessness, willingness to help others, his personal strength and his desire to provide for others. I have no doubt that Jay would have loved our team comradery and how we helped each other up the mountain through the challenging parts of the hike. I had the honor and privilege to place Jay’s stone at the top of Owl Peak at Baxter State Park. This was one of the most moving moments I have ever experienced and somewhere I have no doubt Jay was experiencing it and enjoying it as well with us all. Jay’s character, strength, selflessness and desire to help others will never be forgotten. Thank you for your service Jay. You were a truly strong and remarkable man and you will never be forgotten. You are still having an impact on us all. Your strength, character, selflessness and will be with us all forever. This world is a better place because of you and the impact you had. I carried his stone up Table Rock Mountain today. I had a connection with him because both of us have gardens. I am very sorry for your loss and I will say prayers for him. Sometimes, if you can’t get someone off of your mind, it’s because your mind always knows what your heart is thinking about. When the project was first introduced to us I thought I completely understood how I would feel. I was wrong. At first it felt just like I was carrying a heavy rock, it made me very tired, but while I was hiking I started thinking about Jeremiah and about all of the Veterans that gave their lives for this country. Being able to physically hold the stone of someone who gave their life for my country means so much to me. I can honestly say that I felt a personal connection to him as I read about his personality. I can’t thank him enough for giving his all to his family and his friends and his country. All Americans should have the bravery and love that he had. “Like most of the people in my group, I didn’t know the heroes being carried up the mountain, but I still felt honored to have escorted a fallen hero to the top. I’ve been ponder what to write to all of you for the last couple weeks since the hike, I’ve briefly thought of his service (which was very similar to my brother’s experience from what I could tell), I briefly thought of the herb garden where the stone came from and all the gatherings the stone had seen before it became a part of TSP, and I’ve also thought about the tragic events Jeremiah and the rest of the family had to endure long before the passing of “Jay.” But my mind kept rolling back to one imagine that I was able to find on numerous websites. That image that my mind kept drifting back to was the image of Jeremiah and his infant son. I can sense the love he has for his son in the picture. The picture tells me so many things. With the kiss, I can tell the great love he had for his son and the rest of his family, the way Jeremiah is holding him up, I can sense the immense amount of pride he has in his child and being a father. His famous smile, that cannot actually be seen in the picture, but I can feel his smile in this picture. That one image tells me so much more about Jeremiah. I have never met any of you, or Jeremiah in person, but I know that Jeremiah is the kind of man that I am still striving to be. Loving, caring, family first, hero. All words that I have found to describe and think of when I think about Jeremiah. All things that I hope to be for everyone around me. It was such an honor to carry the stone and story of Jeremiah. It gave me great pride to once again be apart of the Summit Project and carry your son, brother, father, and husband’s stone with me. I had the honor of carrying Jeremiah’s stone during a recent walk in Kennebunk. I am a retired Naval Officer and treasured every one of my men and women and I am certain Jeremiah was treasured by his troops also. Everyone of the men and women of the services are critical and treasured by Americans across the country. It is always regretful when such a vibrant young man becomes a sacrifice for our brave nation. Know Jeremiah’s legacy lives on forever and I was proud and honored to carry Jeremiah’s stone. With great honor and respect. I had the honor and privilege of carrying the stone and story of Jay on a hike up Owl Mtn with the Summit Project on March 27, 2018. A group of 12 hikers each carried a stone and shared the story of the soldier they carried in a circle at the top of the mountain. I spoke proudly about Jay and shared his story of loss, character and courage with the group and others over the weekend. It was easy to speak about Jay, as I was so touched by what I had learned. I was saddened to read about and imagine the deep sense of loss he must have felt to lose his mother at such a young and formative age. The time he spent in the orphanage and the separation from his siblings must have been so difficult. It would have been very easy for these difficult losses to have impacted him in lasting negative ways. But this is not Jay’s story – Jay’s story for me is one of duty, courage and character. As I hiked, I imagined Jay tagging along with the neighbors’ kids, proudly swimming for the High School team, playing horseshoes in the garden and supporting his family and friends. Descriptions of Jay such as “A wonderful individual”, “A keeper”, and “Kind and caring” tell me the story of a young man of great character. I thought about the sense of duty to protect others that Jay felt, and how that likely contributed to his decision to serve active duty in the military and beyond that in the National Guard. Even as he was starting a family, moving back to the neighborhood of his youth, and progressing in his career Jay continued to serve his country. It was truly an honor to represent Jay and place his stone at the top of mountain. The day of the hike was a beautiful day with bright skies and incredible views. It was truly a day to cherish life and express deep gratitude that there are those like Jay that put themselves in harm’s way to protect the freedoms and safety of others. Carrying Jay’s stone brought him to life for me and those that I told about him. His life and deeds inspire me to lead my life in a way that is worthy of his and your sacrifice.